Included in the long list of things you feel the need to do in life is most likely serving others. When you think of serving others, you might get this little guilty feeling start to creep up because you feel like you aren’t really doing much to serve. It is often hard to provide real service to people with a baby or toddler in tow, and it is even harder to get away from that baby and toddler in order to do service without them. We need to broaden our view of what it means to serve others. We need to broaden our perspective on how much of a contribution we need to make verses what we are making. We need to accept what we can do at the time, even if that means narrowing our focus. Last January, I talked about Guilt as a Mother. Service is a great thing to do. It is a noble way to spend our time and definitely worth our efforts to make it happen. Because of this, the adversary would naturally want to figure out ways to make us stop doing service. Satan is sneaky. He isn’t going to try to get you by convincing you that service is bad. No. You are a good person who is striving to do right–he knows he can’t convince you service is bad. He will use much more conniving tactics. He will likely appeal to your guilt. He will make you feel that if you can’t save all of the starving children in Africa, there is really no point in even trying at all. He will tell you service close to home is nothing of value. He will make you focus on how few people you are reaching. He will try to discourage you to the point of giving up. He will convince you to procrastinate until you can do service on a grand scale. Do not listen. This post contains affiliate links. Service is simply the action of helping or doing work for someone (New Oxford American Dictionary). We need to accept a more generous definition of serving than what we often think of. You do not need to leave your neighborhood, much less the country, in order to serve people. You really don’t even have to leave your home. As a mother, you serve people ALL DAY LONG. When you think about where you stand on serving, analyze honestly. Do you feel like you have room for improvement? When you think about that, do you get ideas for improvement, or do you think, “Well, I can’t travel to help build homes in [insert third world country here] so there isn’t much point in me trying”? If you are getting good ideas, go with those, no matter how small they seem. If you are feeling like you can’t possibly make a contribution to the world, ignore that and think of something you can do. How Grand Does Service Have to Be? I am absolutely positive the Lord cares about each and every one of us individually. He cares about “the one.” Your service that only impacts one person counts. It matters. It is worth your time and efforts. I think that most if not all of us would consider Mother Teresa someone who made an impact for good on humanity. She was once questioned by a reporter and told basically that in the grand scheme of things, she was accomplishing “absolutely nothing.” Her reply was that “her work was about love, not statistics.” She sought to serve those within her reach even though the number out of her reach was immense (see Are We Not All Beggars?). What you do for that one person matters. It is worthy. You never know in the moment what kind of domino affect your actions will have into the future. Service can be “small” and still be service. Now, I don’t want to say that and then have people think they don’t have to do anything. We need to do all that we can. Sometimes, all that we can do is grand in the eyes of the world. Sometimes, it is seemingly small. So long as you are doing all you can, then you are on the right path. Pray for others. Sincerely offer prayers on the behalf of other people. Prayer is something you can always give. Meet the needs of your family. Do not discount the service you offer to your family. 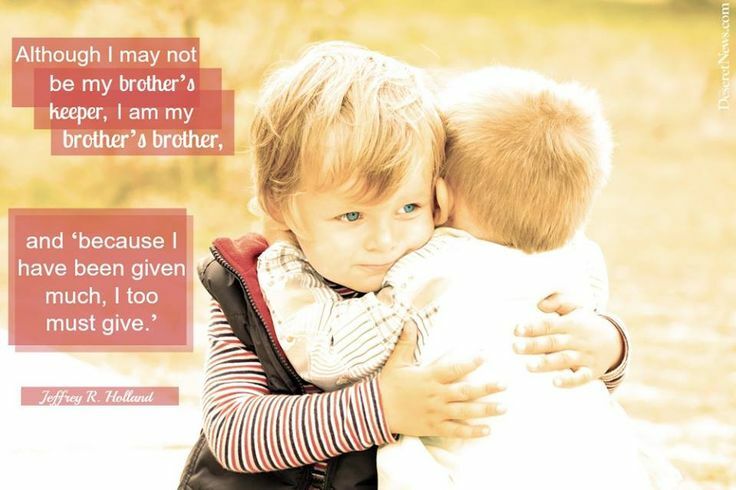 Do not neglect your family in order to do service that is noticed by people outside your home. Your first priority needs to be to your family. That doesn’t mean the family should never sacrifice in order for you to serve. 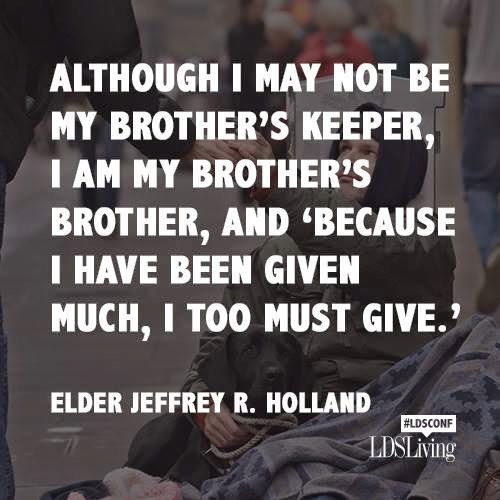 It doesn’t mean your family can’t help you serve others. Most of the time, you can offer full service to your family and still have time for others. Smile at others. Be a kind person as you go about your errands, work day, and home. Helping people be happy and in a good mood is a great service that trickles beyond that one person. Befriend people. When there is someone new who moves into your area, get to know that person. Invite that person to do things socially. Comfort others. Offer love and support to those who need it. Donate money to reputable organizations. Sometimes our time is taxed, but we can find money here and there to offer. Donate clothes and other items. Something as simple as donating your old baby items can be a great service to people! Do manual labor for those who can’t. You can shovel walks, weed gardens, and rake leaves, for example. These are great tasks to get children involved in. Take dinner to someone. When someone you know has a baby, is sick, or has a tragedy in the family, take dinner to them. You can arrange dinner for a certain day and time. You can also make a freezer meal and drop that by so the person can have it when it is most needed. This works well when there are a lot of people bringing meals in or when the person isn’t home much (like in the case of a sick family member). There are often times I don’t necessarily take an entire meal to someone, but part of one. I will decide to make breadsticks that day. My family only eats about half of what I make. I could half the recipe, or for a minimal amount of effort I can make the full recipe and take the breadsticks to someone. I pray to know who could use them, and I always find someone who can be helped out by having the addition to their meal that night. Utilize your talents. There are things you have a unique ability for. You might be a great cook, a great singer, a great instrument player, a great sewer, a great reader, organized, fun, friendly, kind…Think of ways that you can use your talents to bless the lives others. Volunteer in your community. You can help in the school. There might be civic opportunities to serve. You might be able to coach a soccer team. You might help clean the cemetery or clean up trash in the park or along your street. Finally, give yourself grace when analyzing your ability to serve. Are you doing enough? We need to serve and give all that we have (See Mark chapter 12 and Mark 14, versus 6-8). We need to be honest in our assessment of our efforts and not make excuses for ourselves for not doing more. But we also need to balance that with giving ourselves grace and accepting ourselves all that we have. No matter the amount, when we give all that we have, it is enough. Do not let the world tell you that your efforts in your season of life are not worthwhile and not enough. “The one” matters. It matters to that one, and that is enough. I really enjoy your blog and refer to it a lot! My question for you is that my 15 month old son who has been sleeping through the night since 3 1/2 months old has suddenly started waking up at 3:30 every morning! He usually goes back to bed within an hour or so but the loss of his regular nighttime sleep is starting to effect his nap and thus his bedtime…do think this is just a phase and should I go in to tell him to go back to bed? He doesn't cry at all but it keeps my husband and I awake through the monitor…any tips or suggestions would be great! It could be a phase. It could also be teething, a cold, that he is cold…think though all of that and address it if it is. If he is close enough to your room that you could hear him if he was crying, I would lose the baby monitor. It is challenging to teach kids how to serve, especially cheerfully. We're working on it, consistently. Recently there have been opportunity to help with a deep cleaning at a local rescue. We all enjoyed it, so that was a good step in the right direction.